SAN FRANCISCO--(Business Wire)--Wells Fargo and Company (NYSE: WFC) today announced more than 50 grants awarded to nonprofits across the U.S. to promote housing equality for low- to middle-income households in recognition of the 50th anniversary of the Fair Housing Act. The 2018 Wells Fargo Housing Equality 50th Anniversary Grant Program honors fair housing community leaders, advocates, and nonprofits by contributing funding for projects, education and training programs and initiatives that highlight the work of those furthering housing equality in 2018, which marks 50 years since the Fair Housing Act was enacted. The Fair Housing Act provides for equal housing opportunities regardless of race, religion or national origin. In addition to the Housing Equality 50 program, Wells Fargo has a history of investment in innovative programs and initiatives focused on Advancing Homeownership℠ to bring growth, stability and sustainability to households and communities. Hispanic Wealth Building Initiative – Wells Fargo announced in September 2015 the Hispanic Wealth Building Initiative, which includes a projected $125 billion over 10 years in mortgage originations and a goal of $10 million to support initiatives that promote financial education and counseling for Hispanic homebuyers. In continued recognition of the importance of hiring and retaining a diverse workforce, Wells Fargo intends to increase the number of Hispanic home mortgage consultants on its sales team. African American homeownership commitment – Wells Fargo announced in February 2017 a $60 billion lending commitment to create at least 250,000 African American homeowners by 2027 and a pledge to increase the diversity of the Wells Fargo Home Lending sales team. This effort is supported by $15 million in initiatives that promote financial education and counseling over the next decade. American Indian/Alaska Native communities commitment – Last November, Wells Fargo announced a five-year, $50 million commitment to American Indian/Alaska Native communities to help address their unique economic, social and environmental needs including down payment assistance and other programs to advance homeownership as well as affordable housing development. NeighborhoodLIFT® program – An innovative collaboration with NeighborWorks® America and its network members, Wells Fargo has invested more than $400 million in NeighborhoodLIFT and other LIFT programs that offer homebuyer education plus down payment assistance grants to mortgage-ready homebuyers. The effort has created more than 17,600 homeowners through 60 city-specific initiatives since 2012. Already the single largest corporate philanthropic effort of its kind in the company’s history, Wells Fargo intends to double its philanthropic investment in NeighborhoodLIFT in 2018 to $75 million to expand the program to more communities. yourFirst Mortgage® - A conventional loan program that has helped more than 47,000 customers secure $10 billion in home financing to achieve homeownership through lower down payments (three percent down for a fixed rate loan), expanded credit criteria, and incentives for homebuyer education. Recent trends show more than 75 percent of yourFirst Mortgage customers choose to complete the homebuyer education course and earn a closing cost credit. In addition, Wells Fargo serves as a leading provider of volunteers for Habitat for Humanity, Rebuilding Together, and other organizations. Since 1993, through the Wells Fargo Housing Foundation team member volunteer program, Wells Fargo team members have spent more than 4.75 million hours to build and improve more than 7,600 homes for low-income homeowners, seniors, veterans, and families. 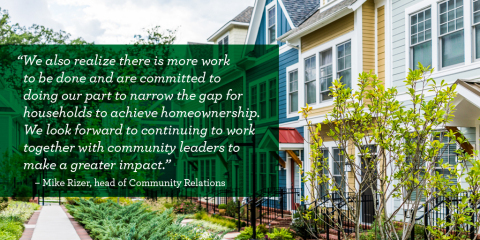 And in 2017, Wells Fargo surpassed its Corporate Social Responsibility economic empowerment goal of building and improving 1,000 homes by 2020 more than two years early. In 2017, Wells Fargo donated $286.5 million to 14,500 nonprofits and Wells Fargo team members volunteered a record 2 million hours. Wells Fargo’s corporate social responsibility efforts are focused on three strategic priorities: diversity and social inclusion, economic empowerment, and environmental sustainability. Wells Fargo & Company (NYSE: WFC) is a diversified, community-based financial services company with $1.9 trillion in assets. Wells Fargo’s vision is to satisfy our customers’ financial needs and help them succeed financially. Founded in 1852 and headquartered in San Francisco, Wells Fargo provides banking, investments, mortgage, and consumer and commercial finance through 8,200 locations, 13,000 ATMs, the internet (wellsfargo.com) and mobile banking, and has offices in 42 countries and territories to support customers who conduct business in the global economy. With approximately 265,000 team members, Wells Fargo serves one in three households in the United States. Wells Fargo & Company was ranked No. 26 on Fortune’s 2018 rankings of America’s largest corporations. News, insights and perspectives from Wells Fargo are also available at Wells Fargo Stories.